The French public and in particular, apiarists, are worried about a non-native bee-eating hornet which is expanding its range. Since being observed for the first time 6 years ago, probably after arriving in a shipment of bonsai planters from China, the species has well and truly established itself in the south-western third of the country centred on Gascony, and by 2009 had reached the Touraine. 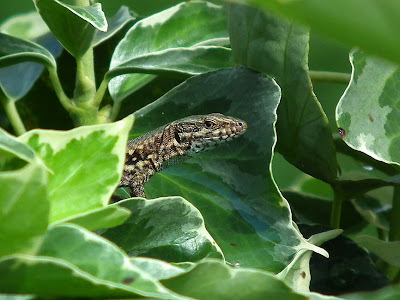 I saw my first one in our garden this summer, and until recently it was the only one I had seen. 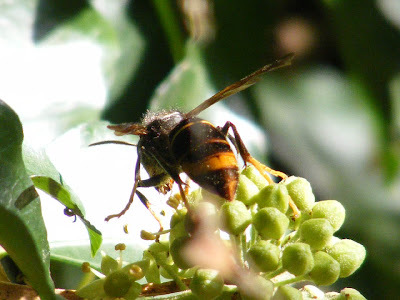 However, not long ago we took clients to see the spooky troglodyte alley in Beaulieu-lès-Loches, and there was a single Asian Hornet Vespa velutina nigrithorax (le Frelon asiatique à pattes jaunes in French) feeding on the ivy in the cutting. It did seem to me that the nearby honey bees were nervous and moved away from it quickly, but it didn't seem to be in the slightest bit interested in them. What it wanted was ivy nectar - the same thing the honey bees were after. Likewise it showed absolutely no interest in me. There have been a couple of attacks reported in the media, and this year a death, but generally they do not interact with people, unless defending their nest. 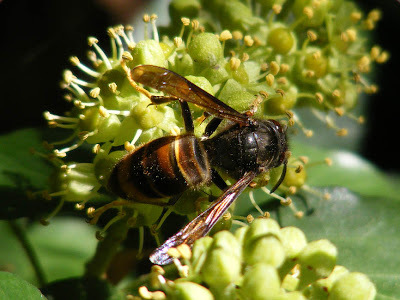 Even before the true level of threat from this foreigner could be assessed by entomologists the apiarists had launched a campaign against them. 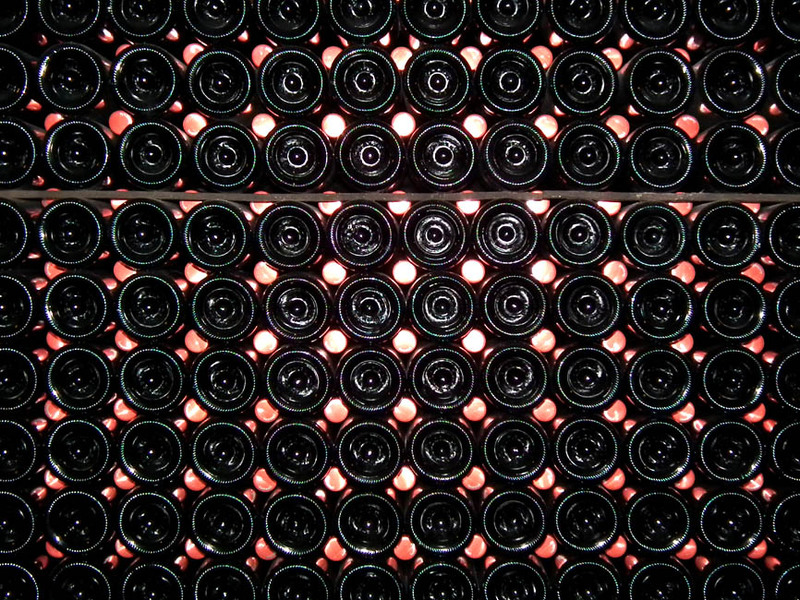 The principal method of control adopted was the use of sweetened beer traps to reduce the numbers of newly emerged queens in the spring. There are some emotive videos on YouTube showing desperate apiarists emptying beer traps full of insect soup on a shockingly regular basis. 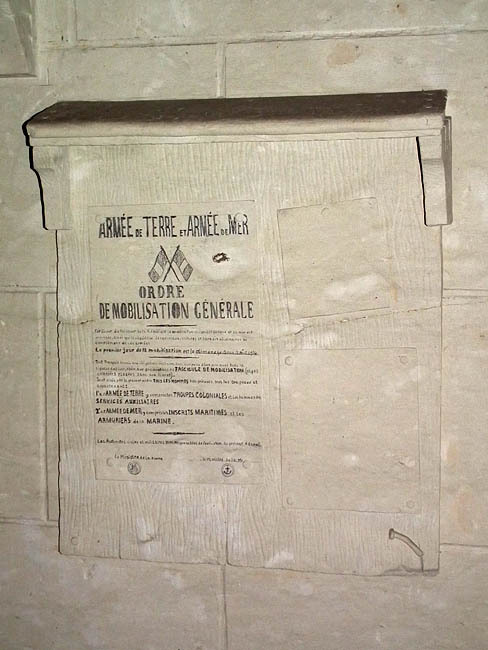 Equally shocking, once the entomologists had a chance to study the situation, were the figures on what species were actually in these traps. Turns out that unless you modify the beer traps carefully, the bulk of their catch is ants, flies and Vespula spp wasps (Common and German Wasps). 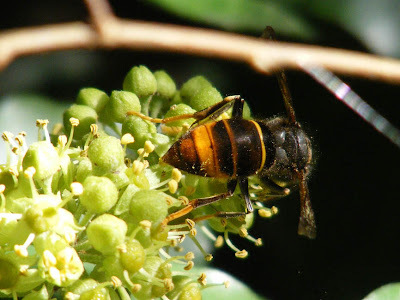 Slightly more European Hornets and more than 4 times as many Honey Bees were caught than Asian Hornets in trials conducted by the Muséum National d'Histoire Naturelle. However the really concerning by-catch was butterflies and on one test site the toll was so high they ended the experiment prematurely as it was felt to be unjustifiable to continue. While they undertake a long term study, the MNHN's interim advice to apiarists is use traps modified so that non-target species can escape or can't get in, baited with old fermented honeycomb and only to set traps out, positioned close to bee hives, during periods of intense attack by Asian Hornets, from August to October. This should have the effect of reducing the pressure on the hive bees. Their current conclusion is that attempting to trap queens in the spring is wasted effort, as most of them will die anyway due to natural causes. The most effective control is to destroy any colonies found later. This must be done before dawn or after dusk, to ensure the nest is occupied at the time. Nests should be injected with insecticide, then cut down and burned to prevent birds eating the poisoned insects and larvae. The fire brigade will do this for a fee of €100. If you read French the MNHN have a lot of information about this problematic species here. 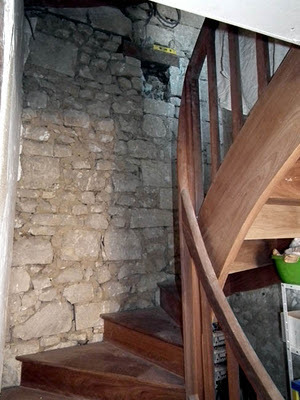 The third step in our great leap forward is the continuing work on the staircase tower. We have now finished three of the six really visible pieces of wall of the tower and are most of the way through the fourth. The third wall progressed in much the same way as the second, but the fourth will be completely different: wall four is to be chaux chanvre. 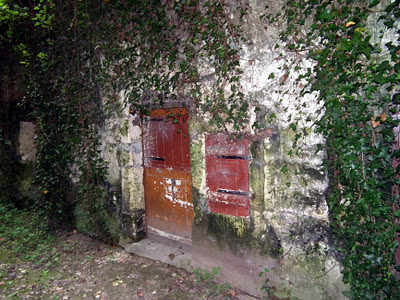 The third wall, between second wall and the colombage. The fourth wall is under the colombage. 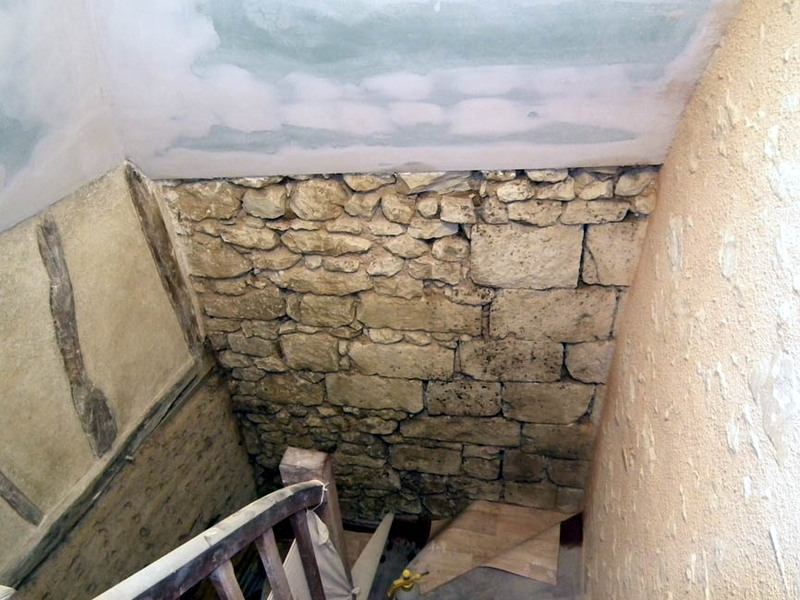 We arrived home on Wednesday evening to find that all the old render had been taken off walls three and four - the wall under the colombage. Wall four was in quite bad shape and quite a large area of wall fell out. This exposed a section of the lath, something we wanted to avoid if possible, on the grounds that the chaux chanvre won't stick to bits of dry old wood. On Thursday Stéphane applied the chaux/sable mixture to wall three, and filled in the gap where part of wall four had fallen off with cement. 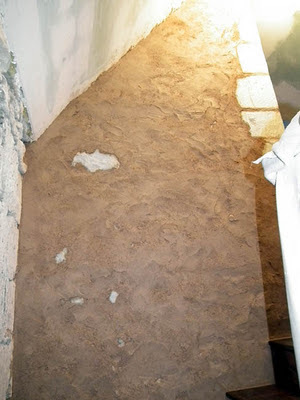 On Friday the excess mixture was brushed off wall three to finish it, and after applying protection to that wall, a really runny mixture of chaux and cement was slopped on to wall four. 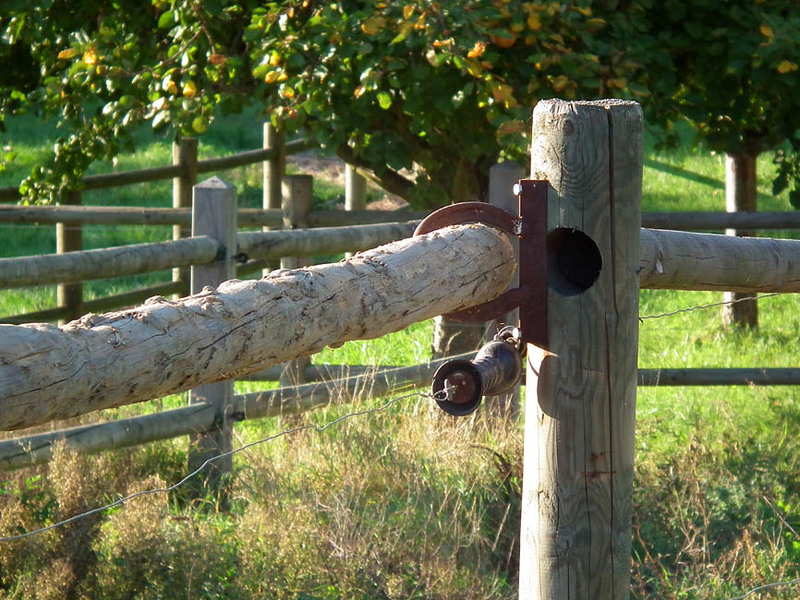 This will give the chaux chanvre something to grip onto. 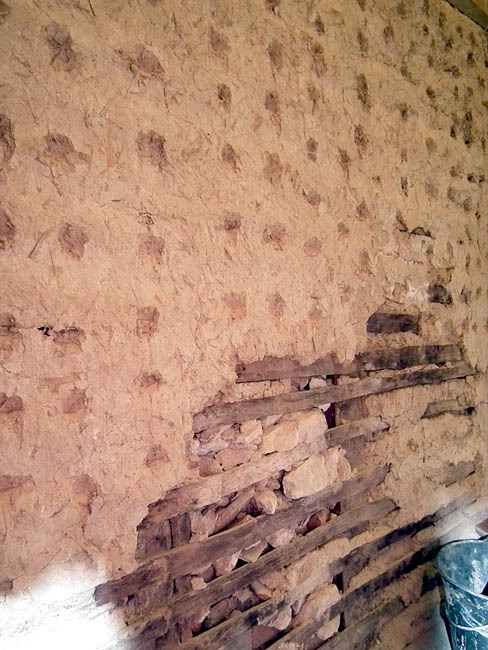 This is where we are this morning: wall three completed, wall four ready for its layer of chaux chanvre which will be applied in one coat about an inch thick. Wall three has quite a few large pieces of stone exposed - you can see them in the first photo, taken before the chaux was applied, and also in the photo below. It looks beautiful. The second of our three steps forward is no less mometous than the first - we have started laying the tiles in the entry hall. We finished the structural stuff in there in July last year, but because we don't see it every day (we mainly use the kitchen door) it kind of falls off the "work to do" radar. 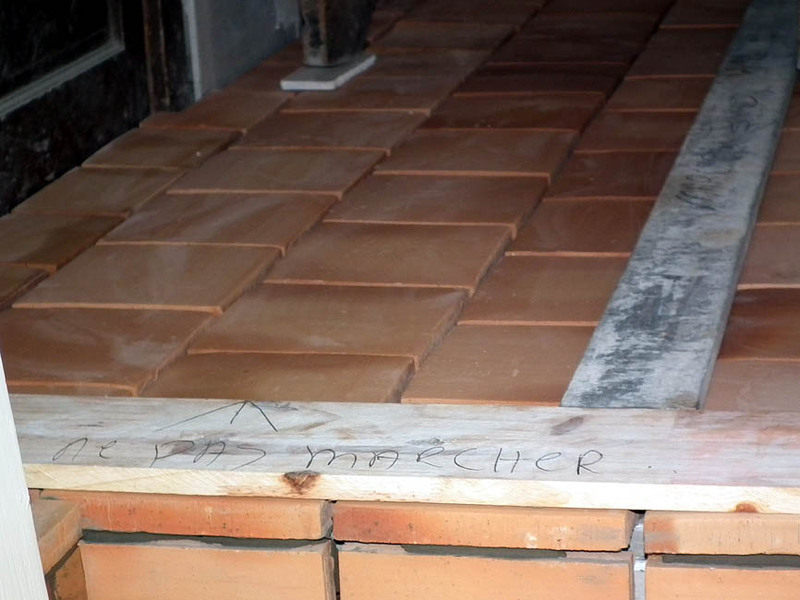 However, we have had the tiles sitting on the front courtyard ever since they were delivered in May. 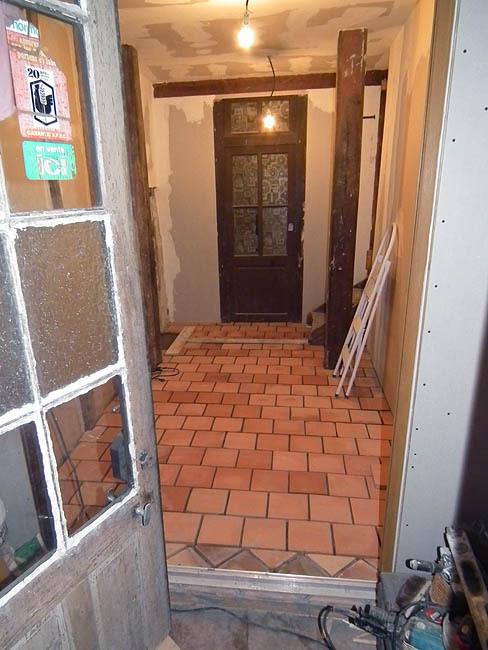 Just over half of them were used to tile the kitchen, and the rest are for the entry hall, laundry and downstairs toilet. As it's not good to have them getting frosted (if they get wet then frosted they delaminate and are no good for man nor beast) we decided the easiest place to store them is glued to the floor they are meant to be on. 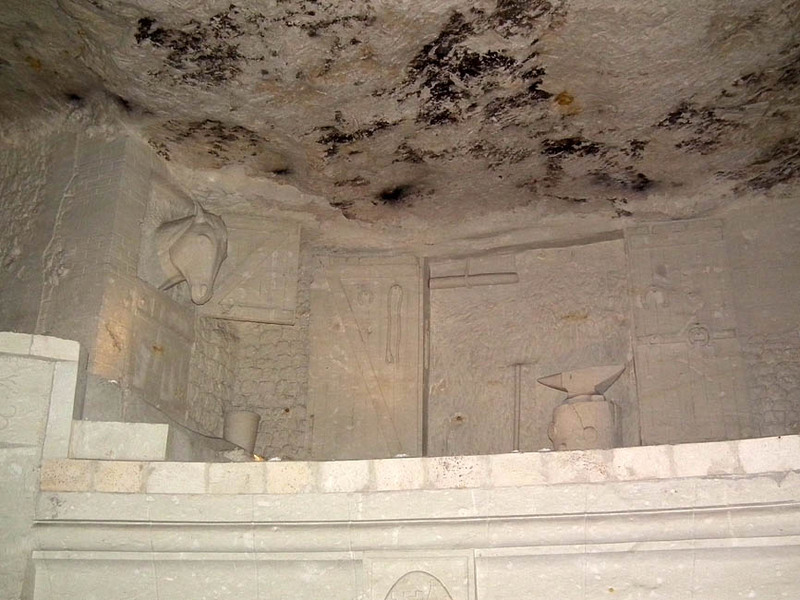 Before we could do that we had to get the joints in the plasterwork done. 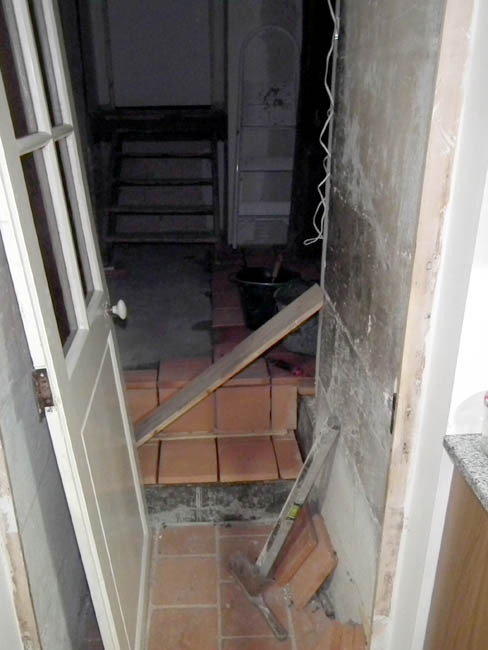 We have had Patrick do that and then the tiles, which he started Thursday morning with the steps from the kitchen, as this was the trickiest part. By the end of Friday the floor was laid. This means we have the weekend to apply the treatments which are necessary to protect and preserve the colour and surface of the terracotta. 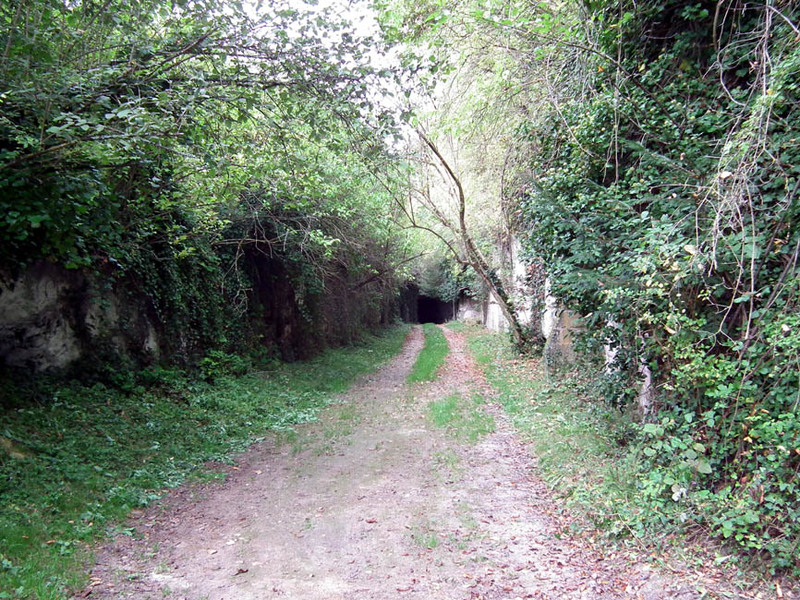 We can start that this afternoon, as Patrick left strict instructions about where we could (and couldn't) walk. On Monday they get joints (grouting) and then we can apply the final coats. 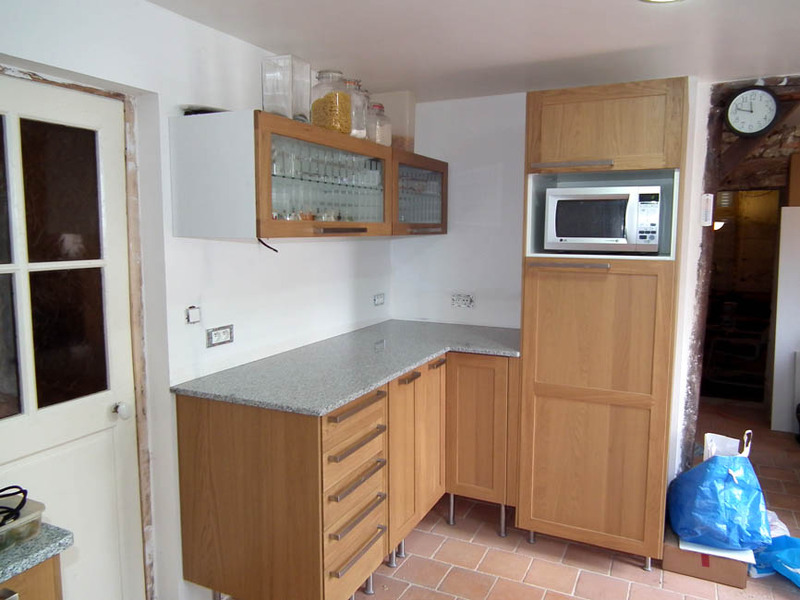 Then, I think we will reorganise the old temporary kitchen into the pantry it is destined to be. 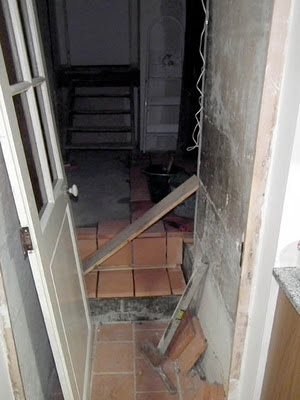 This will also involve moving the freezer out of the kitchen, along the driveway, across the cobbled courtyard, then the tiled floor and into the pantry. Our first step (and the hiccough) is the biggie: The worktops arrived yesterday morning at 08.30, and by 10.30 they were installed and the workers gone. This was not without its problems, however. As is usual with these things, the granite needed to be reduced slightly to fit perfectly. Cutting the stone is always anticipated, so the installers are equipped to do cutting and polishing. There was, however, one major issue. When they were here measuring the workers took away the template supplied with our under counter sink so that the hole could be cut to the appropriate size. Unfortunately the factory didn't read the numbers carefully enough and the sink cutout was completely the wrong shape. This left us with two options - send the granite back and recut, or get another sink. 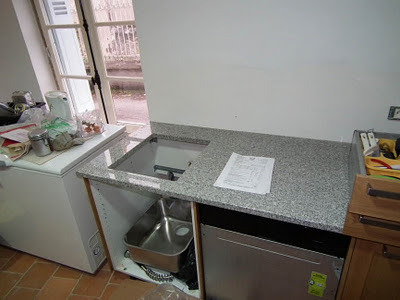 The simplest option for the installers was to get another sink and make the factory that cut the granite pay for it. Because of the size of the hole the new sink will have to be custom made to order, not something we have any problems with, especially as someone else is paying! 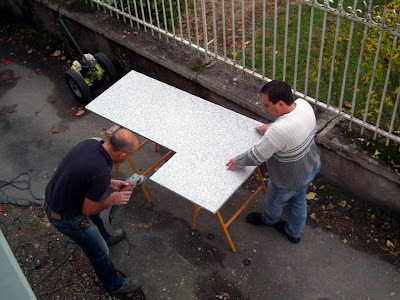 The whole process of getting granite worktops has been very simple and painless. Everyone involved has been really professional and easy to work with, and they even understood the frustrating delay while we waited for the plumber to come and finish the kitchen. We will have to wait a week or two for the new sink, but in the meantime I can start measuring for the tiles to go on the walls above the worktops. 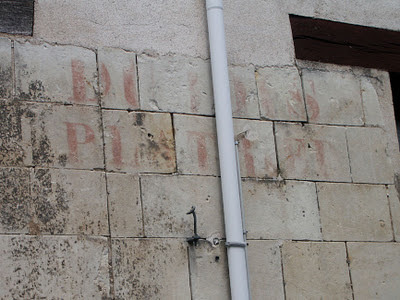 This very ghostly sign is in Preuilly sur Claise, and I know nothing about it. In fact, I can't really work our what it says except for the name Dubois. The second line is a mystery. A name? A description of the trade carried on within? I have read the article about the businesses of rue du Puits Berthet in the archeological society magazine "les Cahiers de la Poterne" but this one isn't mentioned. 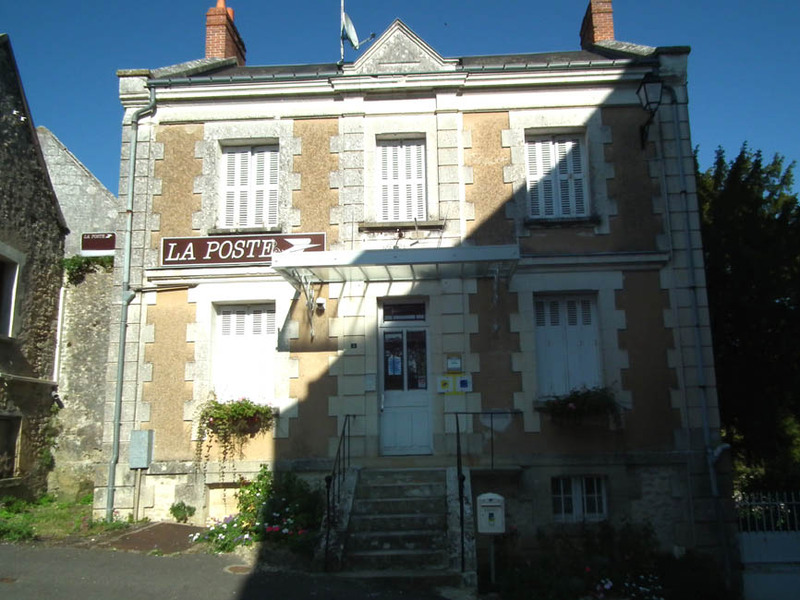 Don't you wish your post office looked like this? In French there are various words for what in English we would call a stock - that is, a savoury liquid made by simmering meat, bones, vegetables and aromatics in water for several hours, used as the base for soups and sauces. In French cuisine you may choose to make a bouillon. This is a fairly typical every day stock, cooked for 2-3 hours and using cheap offcuts of meat, but not many marrow bones. You can use it for soups, stews, sauces and risottos. If you clarify a bouillon by adding egg white, which coagulates and lifts out the impurities, it becomes a consommé, to be used for clear, refined soups and aspic. 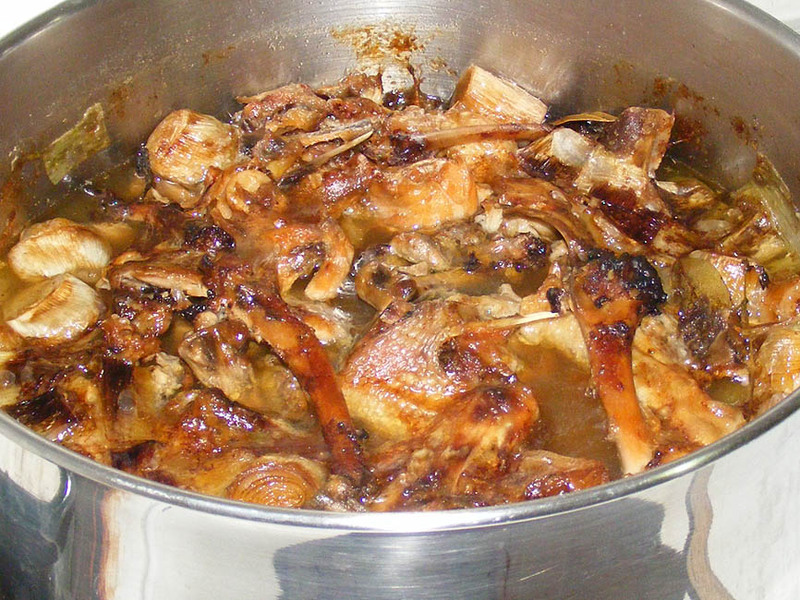 A court-bouillon is a weak bouillon created by shortening the simmering time to an hour or less and diluting the stock produced even further with white wine. It is generally only used for fish or very delicately flavoured poached dishes. If you reduce a bouillon or court-bouillon it becomes a strong flavoured stock known as a fumet. 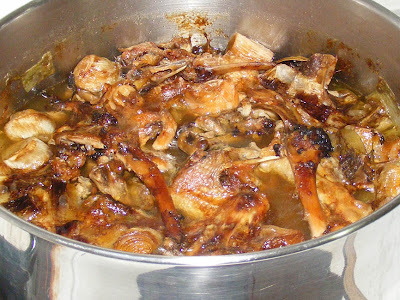 Most delicious of all, if you make a full bodied stock, in a pan packed with bones and vegetables and cooked for 4-6 hours on the gentlest heat, you have made a fond. The word fond means 'base'. They can be blanc, made from veal or poultry, or brun, made with roasted bones, for extra colour and flavour. A fond should gel when it cools because the longer cooking converts the collagen in the meat to gelatin. Fonds are used to make many rich and unctuous sauces such as veloutés and demi-glaces. 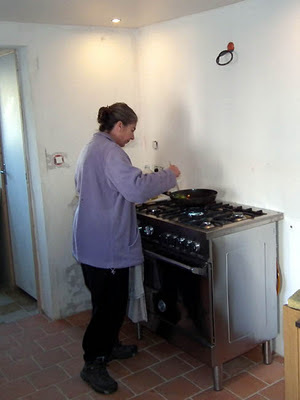 Recently I discovered that an excellent way to make a fond was to put a stock pot on the stove at lunch time, then go to Chateauroux for the afternoon, forgetting to turn off the heat. home to a charred and ruined stockpot. ... you have to make one. Which is exactly why we have been taking stones out of our metre thick wall. I have always liked the look of niches in stonework, but in this house we only have one which is in a roof space that was too low to use so was blocked off when we insulated. 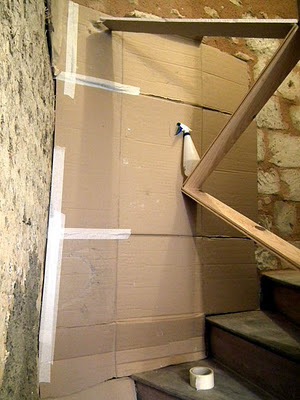 Thus I decided that I would like a niche half way up the stairs, a place which is always difficult to decorate. 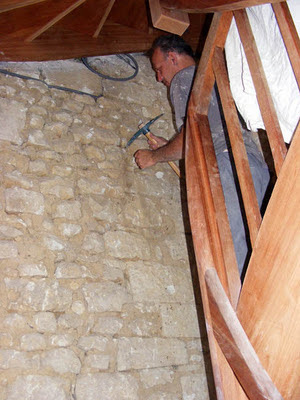 This we started as soon as the first lot of pierres vues work on the upper staircase was finished. After identifying a place where both the stonework would allow us to remove stones without collapsing and the niche would be viewable, we started - gently at first, but progressing on to hitting things with a hammer and levering with a crowbar. 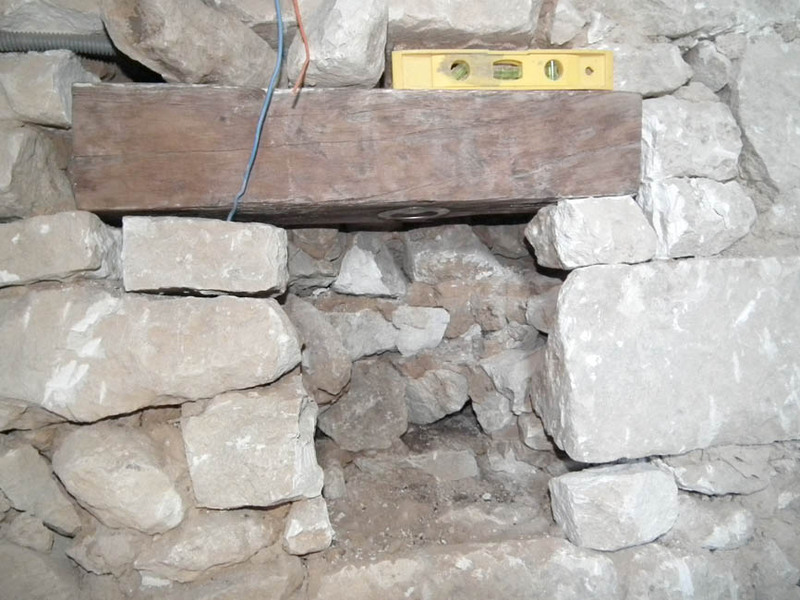 It was interesting (if a little alarming) seeing a 1 metre section of wall compressing sideways as we levered, but we managed to take out the required stones without causing any damage. 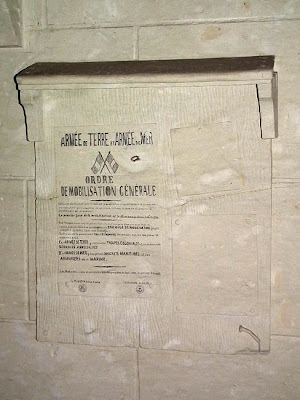 This has left us with a niche about 20cmx25cm. 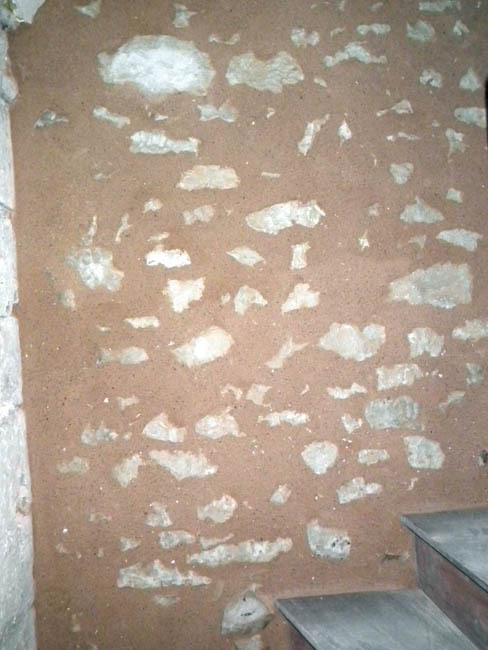 The stones we removed to create the niche are really in what is the end wall of the graineterie, the oldest part of the building(s). 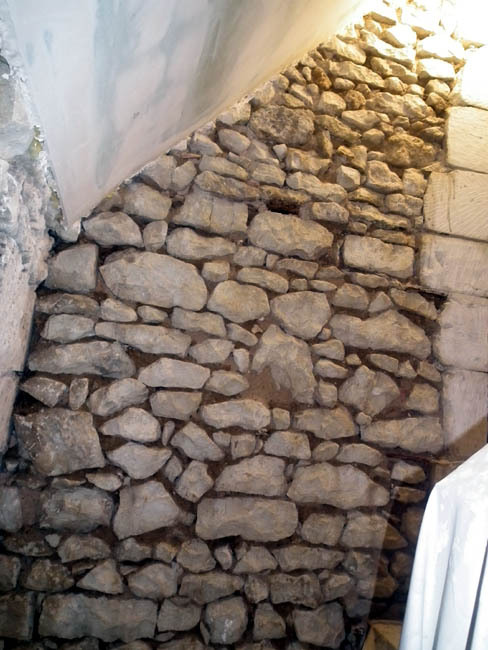 The construction is typical of very old stone buildings, and is a sandwich of two thin (and quite skimpily mortared) stone walls infilled with mud and smaller stones. 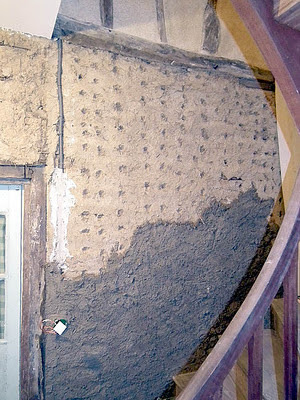 This makes for a very solid, thick wall which should hold itself together for a long time. Now we have exposed the mud we have to cover it up again, which we will be doing with chaux mortar. We have put in an oak lintel, made out of the wood that was once our back door's doorpost, and we have set a low energy downlighter which was surplus to requirements in the the kitchen into it. The next big decision is what we are going to put in the niche, but that will have to wait: we have serious kitchen fettling to do this week. Although we have crashed into winter, with temperatures dropping below 0°C and not rising above 15°C, following a warm spell of weather with temperatures in the 20s, it's the sort of winter everyone can enjoy. The frost has been heavy, but the days clear and sunny, and the late season butterflies are hanging on, nourished by ivy, valerian and African marigolds. Speaking of marigolds, one of the most common butterflies on the wing at the moment is the Clouded Yellow Colias crocea. Its French name is le Souci (i.e. 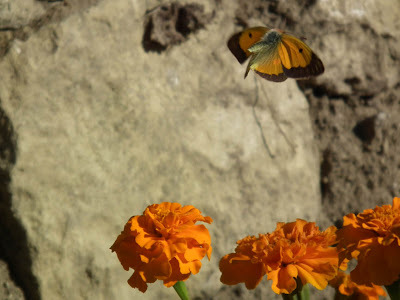 the Marigold). Simon took advantage of one of the 'motor drive' type functions on his new camera to take a series of wonderful photos of Clouded Yellows working over some African marigolds up by the chateau on a sunny afternoon a few days ago. He was amazed by how much effort flying takes and what muscular power these butterflies have. 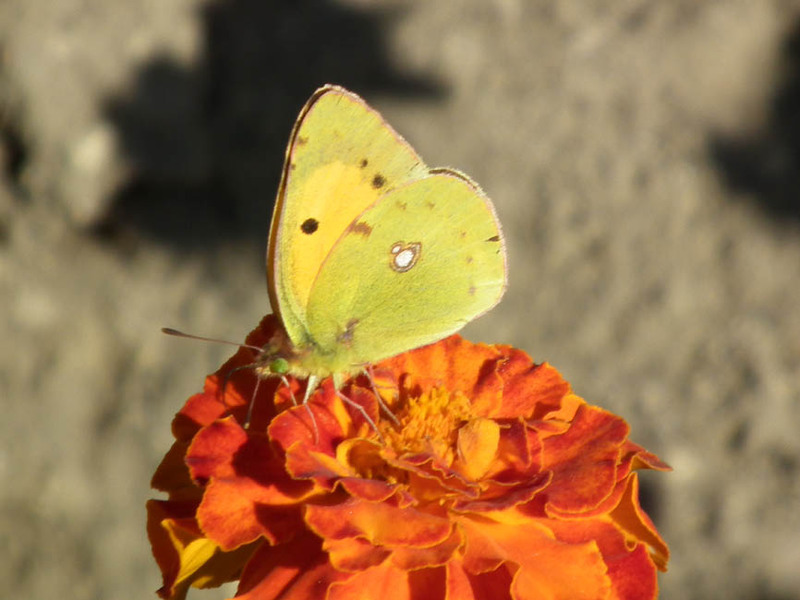 Theoretically, we get 3 species of Clouded Yellow here - Pale Clouded Yellow C. hyale, Berger's Clouded Yellow C. alfacariensis and Clouded Yellow C. crocea. 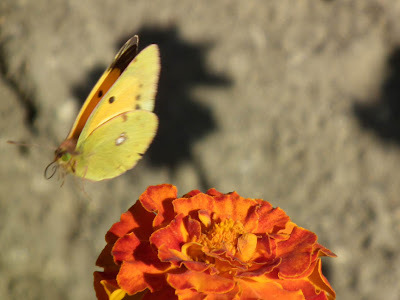 In practice, my experience is that if you see a Clouded Yellow it will almost always be C. crocea. The 3 species are notoriously difficult to tell apart. There are some subtle differences in wing shapes (virtually impossible to distinguish without having the different species side by side to compare) and all the other features observable with the naked eye concern the patterning on the upper sides of the wings. 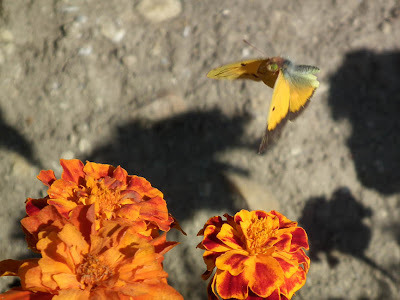 Unfortunately, this species almost never rests with its wings open, and you can not always be sure of the details if you see them bouncing past you on the wing. Being able to take action shots that freeze the view of the upper sides really helps with identification later. I find the easiest feature to check is the dark band on the edges of the lower wings. If it is thick and dark rather than petering out into thin scallops or even reduced to a series of spots the butterfly is C. crocea. If the dark margin is weaker, you have one of the other species (and a real headache if you want to get further than that). They pass the winter as caterpillars, coming out to eat various legumes when the weather allows and slowly growing until they can transform into adults in the spring. PS Souci is actually the French for Pot Marigold Calendula officinalis, not African Marigold Tagetes hybrids. 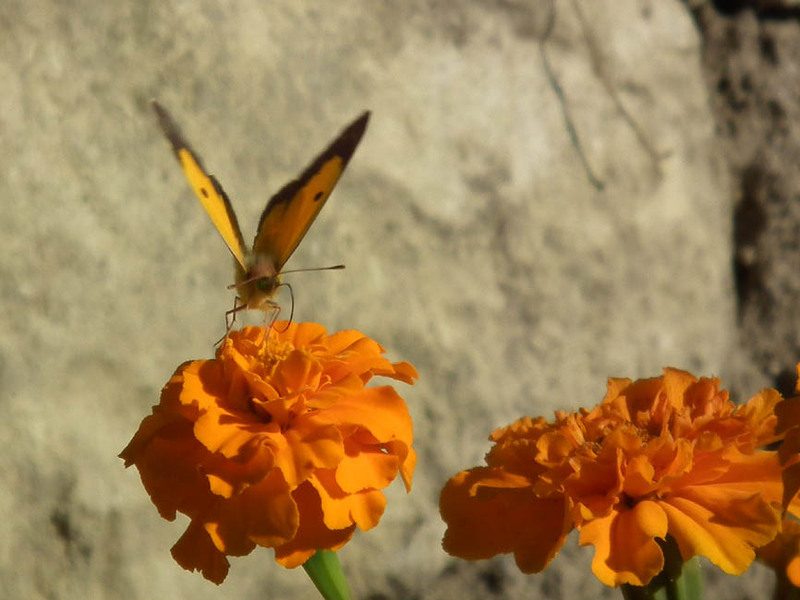 African Marigolds are also known as French Marigolds. Simon was not wearing Marigolds when he took these photos - that would be silly. Yesterday at 9.00am there was a knock at the door. It was Mickael the plumber, who we had last seen at the start of July, here to finish the plumbing he didn't get done that day. In addition to installing the pipework for the sinks, he fitted the raccordements for the gas stove top. This means that in addition to the electric oven we have been using for a couple of months we now have a fully functioning cooker top. Let me introduce you to "The Beast" aka the Italian Job MkII. 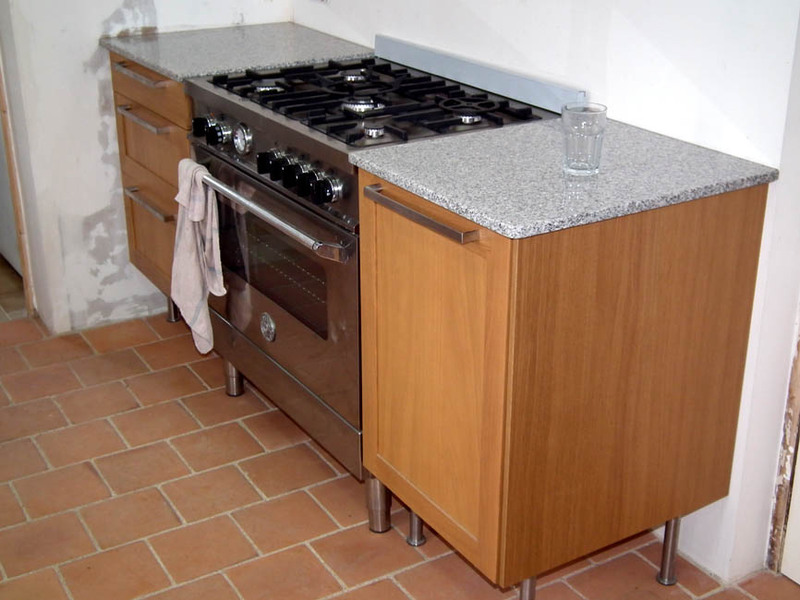 It is a Bertazzoni A 90 5 MFE XE, an Italian cooker with five gas burners and a huge 108 litre oven. 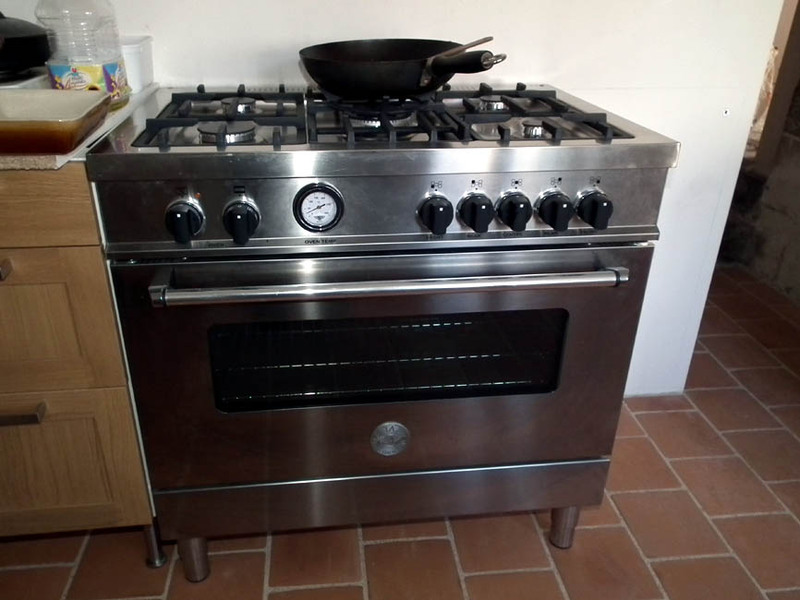 We were very lucky to get this cooker, as normally it would have been well out of our price range. Regular readers may remember back in January this year I wrote about the effort needed to find a good cooker at a good price. After that post a blog reader de-lurked to say that they had a cooker sitting on their terrace that they wanted done with. We rang Chris and Annie (for it was them) and chatted about the cooker, which had been delivered to them by mistake. That is, they had ordered a cooker from the UK, and when it arrived it was the wrong one. Amazingly, the person who subsequently delivered the right one had been given no instructions about the previous cooker, so it was left, sitting on the terrace. After that, the logistics of getting it back just became too complicated. A large crate is not the right aesthetic for a stylish terrace, and understandably no-one wanted it just sitting there for another winter. We popped over to visit, which was a really pleasant way to spend an afternoon, and after looking at the cooker decided to make a totally inadequate offer to the shop it had come from. Amazingly, the offer was accepted, so we drove over again, had a nice glass of wine and loaded the cooker into the car and came home. After that it sat in our garage for a couple of months. We had Benoît, one of Mickael's colleagues from Bertucelli's, put in the pipework for the gas in March, then after the kitchen floor was tiled the cooker was brought inside and the electric oven wired up. And there it sat until yesterday, when the puzzle of why we couldn't find the right flexible to connect the gas was solved - Benoît had soldered on the wrong thread (gas bottle thread is left handed). Mickael sorted it out in no time, and while he was doing that we went off to Yzeures to buy our first gas bottle from the service station (10kg of Butane, costing €9.95 plus a €1 security deposit on the gas bottle itself). Based on our consumption of 250ml camping gas cannisters we figure it will last at least 6 months. This was such a great leap forward that Susan felt a bit overwhelmed. She opted to start by cooking a simple fried rice to test the double ringed wok burner. This was a success. Somewhat unfortunately, at dinner time we were considerably distracted by a couple of time consuming enquiries about tours, and by the time we got around to cooking it was getting late, so we just had braised pork chops, steamed potatoes and peas. It is obvious the bigger burners are going to take a bit of getting used to as it seems to be impossible to turn them down below 'boiling furiously'. The potatoes narrowly avoided being burnt after boiling dry, but the chops turned out rather well. And the most important thing was that we were using 3 burners at once! It's going to take some time to realise just how much this can expand our repertoire. 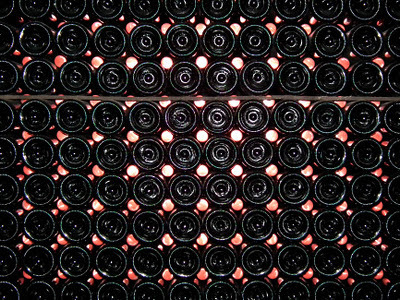 The bottles are stored horizontally for two years during secondary fermentation - the "méthode traditionnelle" also used in champagne making. 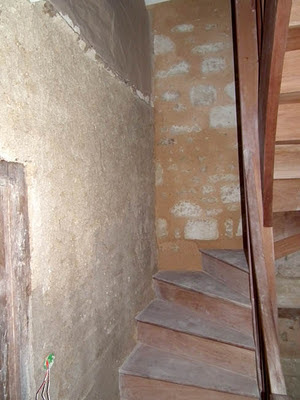 I wrote last week about doing the chaux chanvre at the top of the staircase tower. The other walls of the tower need finishing too, and most of this is being done the same way we finished one of the staircase walls last year, even down to the amount of dust created by removing the old render. the stone you want to see. We have now started on the other walls: there are two walls on the staircase that need the same treatment, and teo walls we will have covered in chaux chanvre. Although this means that the staircase walls will not all be finished the same, it appears that this is the way the walls were originally done and it will be nice to give a nod to the age (and complexity) of the building. The folks over at the chateau de Chatelier breed les chevaux selles français, a lovely saddle horse that has been developed from the 18th century crosses of Norman riding mares with the new English Thoroughbred stallions (themselves developed from the 3 famous Arab stallions imported in the late 17th - early 18th century). 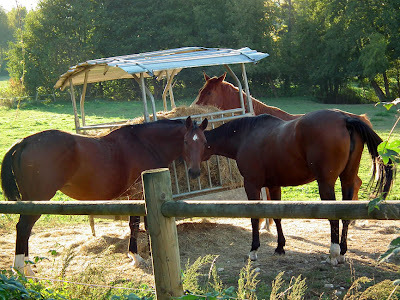 Selles français are classified as a warmblood, which means they are mid-weight horses bred for equestrian sports such as show jumping and trotting races. They are not a breed but a type of horse. I liked the nifty use of horseshoe fittings on the sliprails. 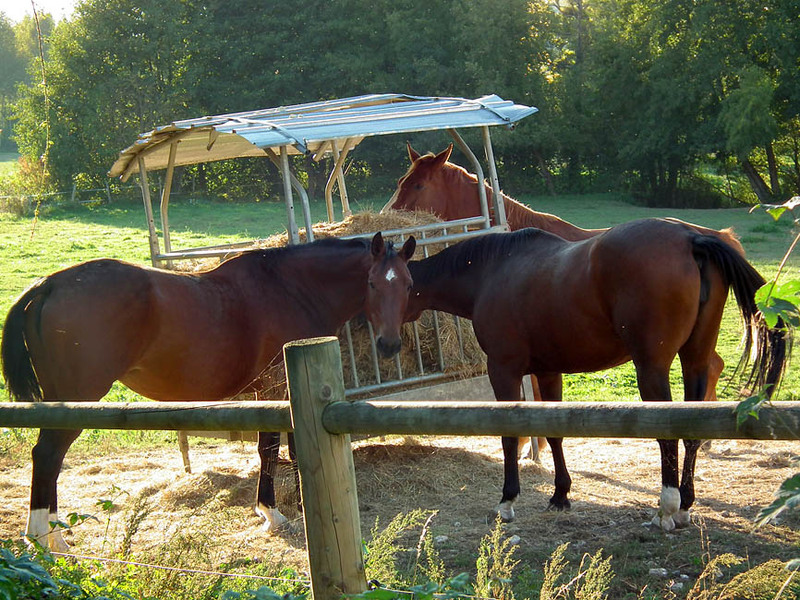 The two bay colts in the foreground are typical of the French Saddle Horses I have seen around here. 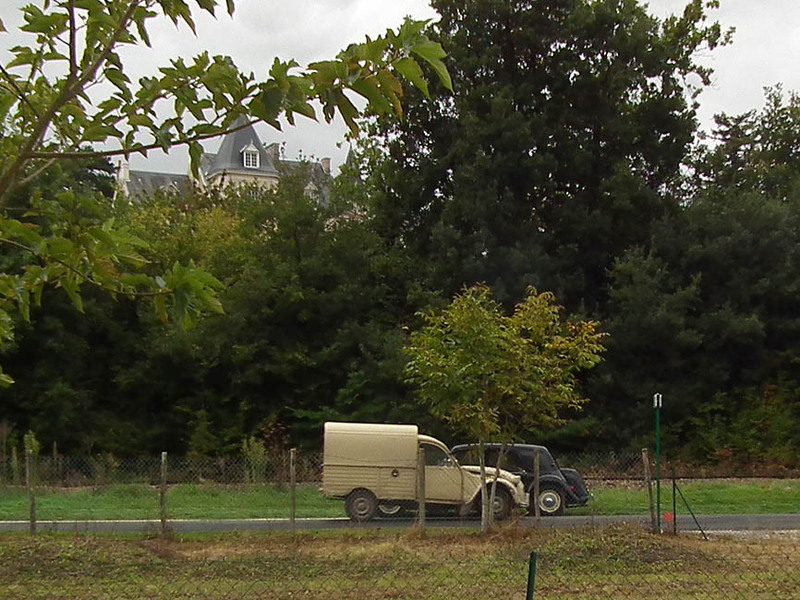 The chestnut in the background, on the other hand, was absolutely enormous, and clearly very, very bored. He came over immediately to engage with us and indulge in a bit of windsucking and rail chewing when we turned out not to be as entertaining as he had hoped. We have been big fans of the éoliennes (windmills) made by the Bollée foundry in the 19th century, ever since we discovered one near Yzeures. the chateau in the background. 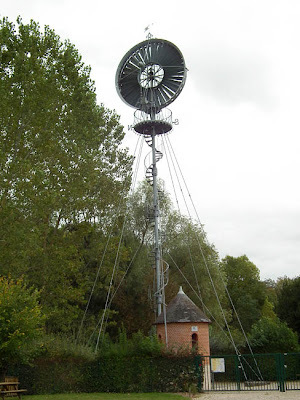 Recently we had clients who were an engineer and an architect so we stopped off at the very impressive, fully restored Eolienne Bollée on the outskirts of the small town of Esvres on the Indre river. The mushroom caves at Bourré, owned by the Delalande family, have recognised that there is considerable tourist potential in their warren of underground galleries. 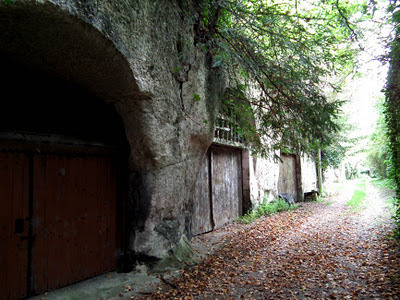 When you visit you can not only see the mushroom growing facility, but you can also go to the underground village. Apparently, this was created by the son of the current owner, who had a spell out of work in the late 80s and in order to keep himself occupied, began carving in one of the unused underground galleries. 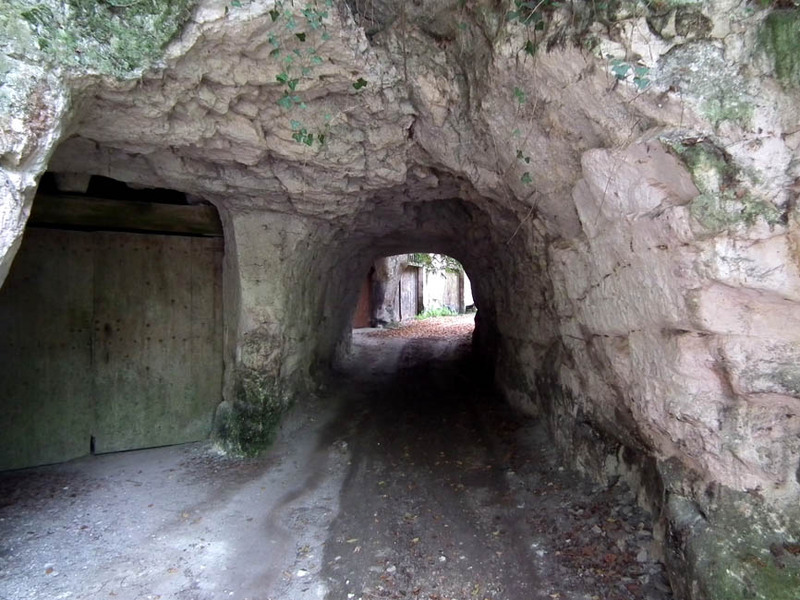 His father realised that it could be turned into a tourist attraction and paid him to create an entire underground village. 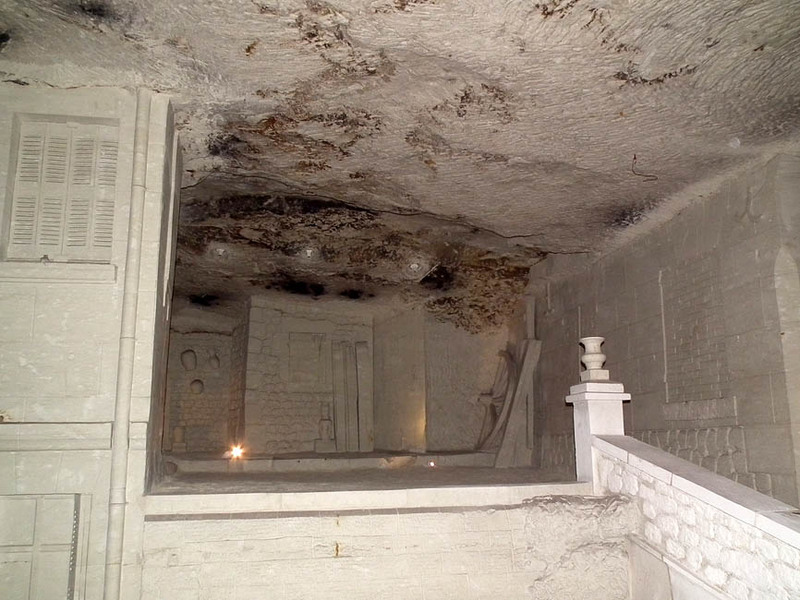 It took 12 years to complete and became something of a heritage project too. 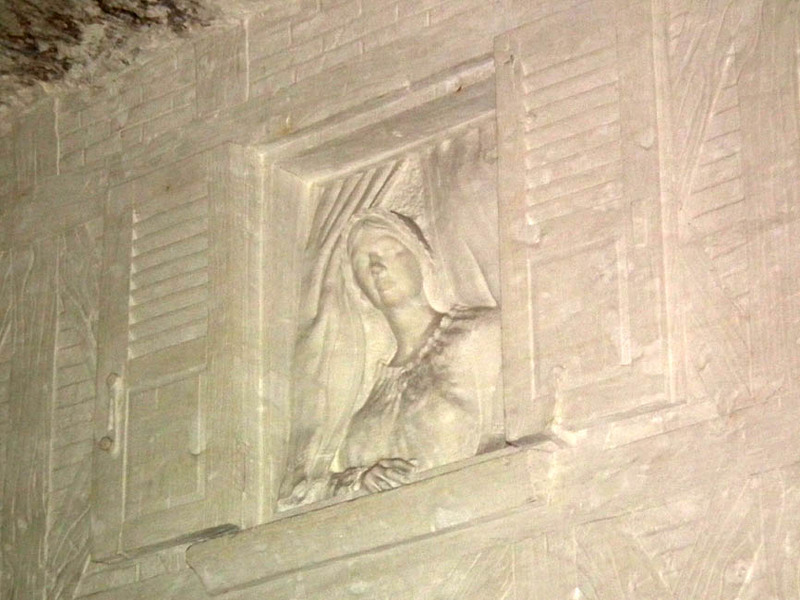 They could see that the old masonry and stone carving skills were being lost and that fine old carvings were being destroyed just through exposure to the weather. 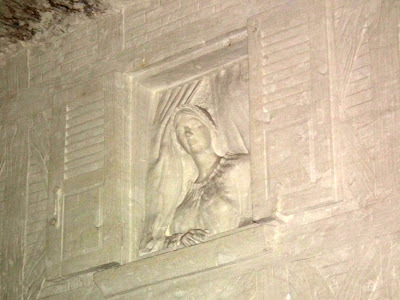 If they reproduced these skills, as well as illustrating in stone other traditional building techniques, the weather couldn't affect it. Sadly, after a decade of being open to the public, they are thinking they may have to close the village, because like in the prehistoric Lascaux caves, visitors breath is causing the stone to deteriorate. This post was published some time ago then withdrawn in accordance with the Delalande family's wishes. 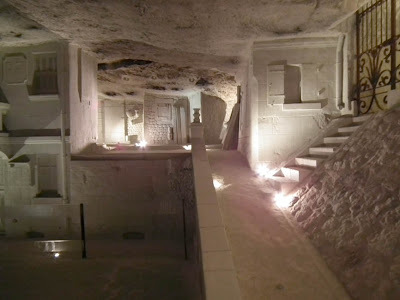 It is now republished because they have decided to pay a portion of visitors' entry ticket price to the sculptor and mason who created the underground village. I assume this is a pragmatic move as many people ignored or did not understand the original restriction on publishing photos of the place. It is only on walking the track that you become aware that is has some properties that Susan and I have never encountered before in this area - it enters a tunnel hewn by hand, before emerging into a cutting with caves on each side. 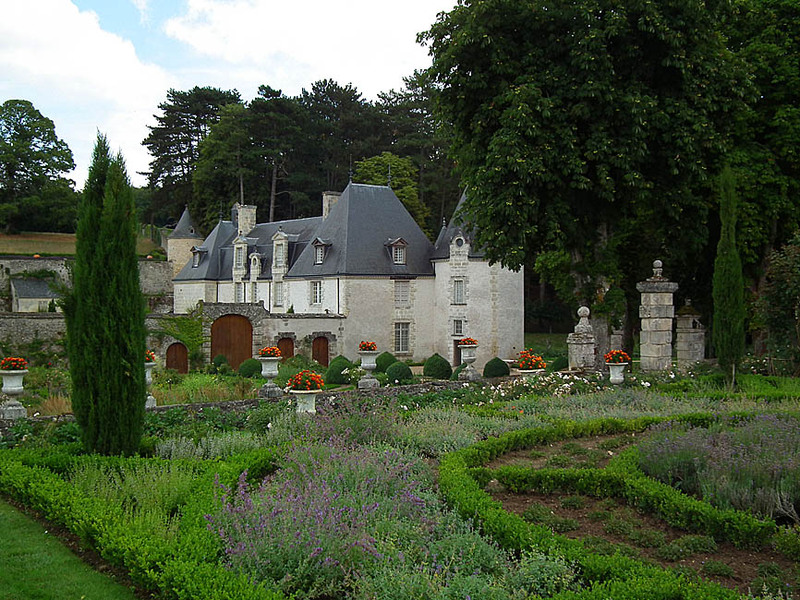 Villandry may have the name and the fame, but nearby Chatonnière is also a very pleasant place to visit. 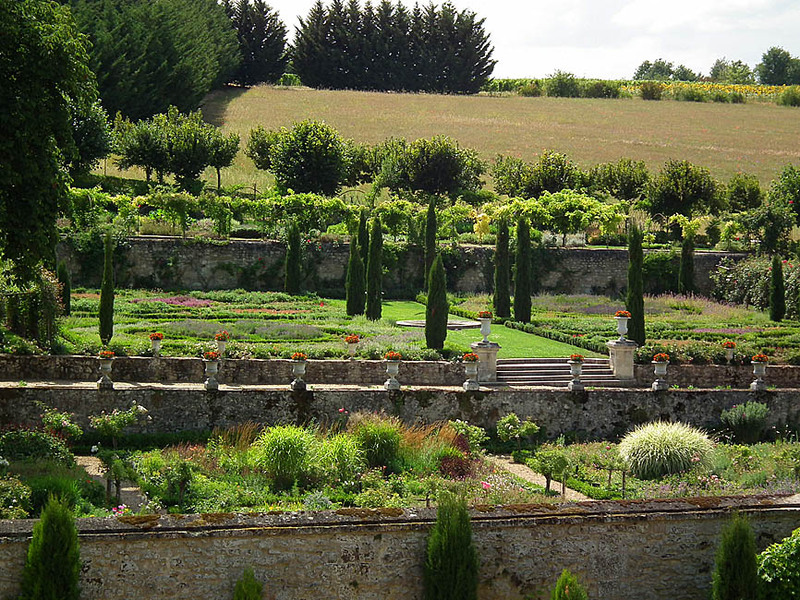 For me, Villandry is a designer's garden, whereas Chatonnière is a gardener's garden. An overview, taken from the terrace above the house. 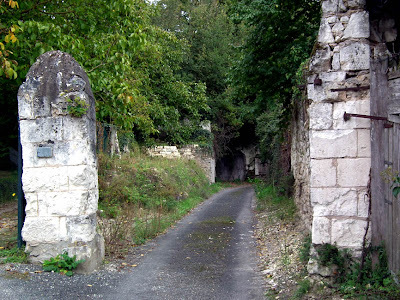 It is clear that the budget is much less at Chatonnière, and it is said locally that the owner, Béatrice de Andia, is radin (= stingy). Plants here appear to be chosen sometimes for their ease of maintenance. Garden beds are not always immaculately weeded or trimmed here, but in many ways that adds to its appeal. As an ordinary home gardener, you feel comfortable here. You can imagine yourself creating a couple of beds full of billowing perennials or the chequerboard herb garden or the bank of roses, as seen at la Chatonnière. Lizards abound in the garden, a good signal that it is sustainably managed. 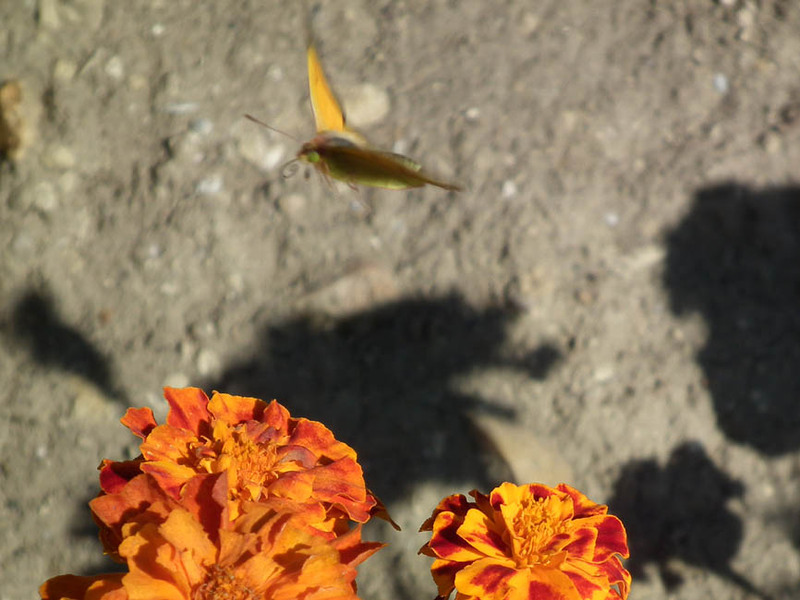 With just four apprentices working for him, Ahmed Azéroual, the Head Gardener, has created a beautiful garden. Every year or so there is some major new addition and the garden expands. He is a remarkable person and it will be interesting to see how the garden fares after his retirement in a couple of years time. Perhaps we will all be heading off to Morocco, where he is already creating a garden for his bed and breakfast complex, in readiness for life after Chatonnière and Villandry. Looking across the garden to the house. The courtyard is guarded by four bergers allemands (German Shepherd dogs) so is off limits to visitors. 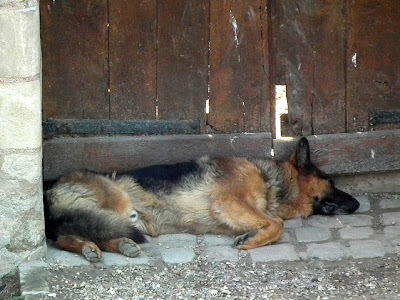 Their technique appears to be to sleep in front of the gates so that anyone entering disturbs them. Finishing the start of that job. 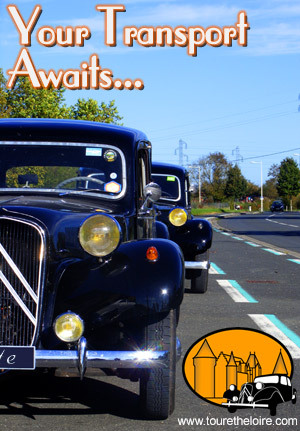 What's Happening in October Around Preuilly?